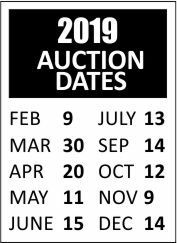 If you are new to the auction process our friendly staff will be happy to assist and talk you through how to buy and sell at auction and answer any questions you may have. Please call us on local rate 0345 257 3070 which is free to most mobiles or use the below form to send us a message. To buy at Saturday Auction you will first need to register. This is a very simple process carried out on the day of the auction. Once registered you will be issued with a bidding number/paddle which will entitle you to bid. We charge a very competitive buyers premium of just 10% (minimum of £1) on the sale price of each lot. All lots purchased must be paid for in full and removed from the venue by 3pm on the day of the auction, unless agreed in advance with the auctioneers. Whether you are a private individual who needs to de-clutter or you are a dealer, you are very welcome to enter your items for sale with us at Saturday Auction. Our sellers commission is very competitive and charged at just 10% (minimum of £1) whichever is the higher, together with a £1 lotting fee per lot to cover cataloguing and marketing. Sale items can be entered into auction by bringing them to the venue the day before the sale between 11am – 2pm. Lots are allocated quite quickly, therefore, it is advisable to contact us in advance to advise what you are bringing in order to avoid disappointment.